Since beef is the flavour of the season, here’s my take on it. 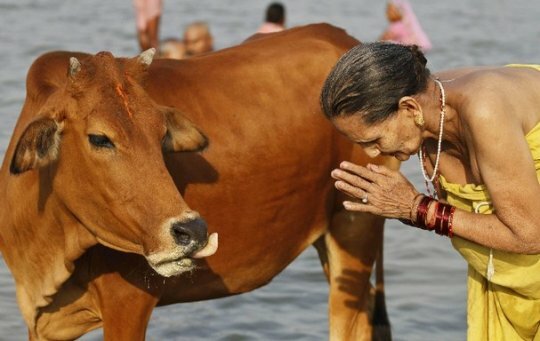 Raised as a Hindu, beef has been a strict no-no. However, it was easy to maintain safe distance from the dreaded meat until I was in India. Slaughter houses are normally different for chicken-mutton and bara (as beef is referred to in North). Restaurants that serve beef are either at the very posh locations or the shady ones; neither of which fit my bill. Then I came to Dubai.I still don’t eat beef. But how do I manage these everyday situations. Beef and chicken are stored next to each other in supermarkets. In a restaurant, you order for chicken or vegetarian fried rice. But just before you the chef prepared beef fried rice in that same wok. In Dubai, I came across this surprising fact. A majority of people from Kerala and other Southern states eat beef; Hindus I mean, whatever be the caste they hail from. I didn’t know of this back in India. And a more surprising fact – the chances of a Pakistani restaurant not serving beef is more than for an Indian restaurant. Strange na! So how has been my experience with beef. Not being a cool foodie has been difficult. I went to Europe last month and I would spend more time ordering the right meats…it is tough making the French or Italians understand why I can’t have beef or pork. But I had beef once…accidentally. I didn’t find the taste much different from goat meat. That doesn’t make me a less Hindu though. I wouldn’t have beef because I am not used to it. And I am too old to acquire the taste. To be frank I don’t like the reddish black color of the meat. As a summary. Let people eat whatever they want to eat man! Why to interfere in other people’s eating habits. Imagine you being made to skip a food that you like. Any Hindus here who skip chicken or mutton for Saavan or Navratri. As soon as the period ends you rush to get your meat. So why are you not letting the beef eaters (they can belong to any religion) have their food. Take a cue from United Arab Emirates if you can. A Muslim country that it is, it allows sale of pork.